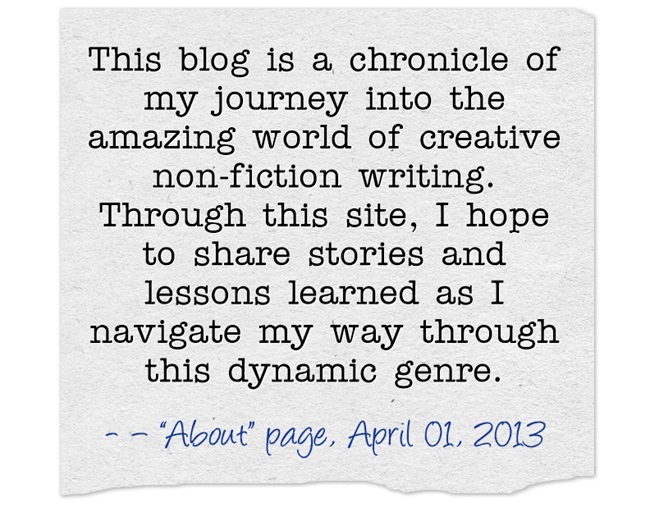 When I started this blog on April 1, 2013, it didn’t occur to me that it was April Fool’s day because I was so determined to create a blog focused on writing. Prior to this blog, I had another one, where I wrote about various things. I changed the name of that blog several times over the course of two years because I was not sure what I wanted to write about. I finally closed that blog after I realized that what I really wanted to do was to learn how to write again – and differently this time around. I decided to blog about my writing journey as a way of forcing myself to keep on learning about writing even as I continued to work as an energy therapist. It wasn’t hard to think of things to write. I simply put on the same thinking cap I used when I worked as a feature writer. Joining blogging events also helped me stay on the blogging track and learn from other bloggers. The more I blogged, the more I became focused on writing. 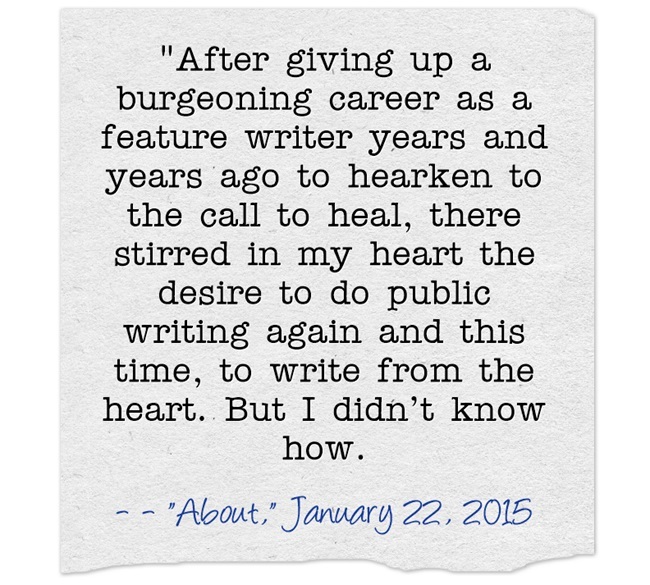 I fell in love with writing publicly again, although I still kept on journaling almost daily. I soon found myself finding ways to incorporate more writing into my life. As I continued to journal and blog with joy, that persistent call to write a first draft surfaced no matter how hard I tried to bury it. It refused to die. I took an online course. After the memoir class check-in webinar in December, I took the time to sift through books about memoir writing. I settled for two books that would provide daily encouragement and impetus. I sat down and talked to myself about my writing community and the need for it. I decided that I didn’t have enough time to participate in a writing group and made peace with my decision to leave the group. I took a long hard look at the realities of my life. For several weeks I observed myself – how I weaved in and out of chores, work, writing, running errands and indulging in hobbies. I discovered that I enjoy writing most when it’s dark – at dawn and at night. But I also realized that if I dangle a small prize for writing in the hours after lunch (on days when I don’t have sessions), I can put in an hour of continuous writing. I had been journaling since I was a teenager, and I asked myself how journaling would be affected if I begin to write a first draft. Where am I now? Am I writing a first draft? I continue to take baby steps since the memoir class ended. It’s an entirely different scenario though when you know that your teacher will read manuscripts only on Sundays, so better have your work submitted by Saturday evening at the latest. After all the things I have done as I take small steps towards completing a first draft, do I have a plan? Not really. But I do have a stronger intent now that I have considered all the pros and cons, the ins and outs, the whys and wherefores. The best thing is that I am blogging about this new voyage, and I’ve decided to focus my blogging posts on this new undertaking. Hopefully sometime in the not so distant future, I will post about editing the first draft. The first draft should capture ideas while they flit through our minds. We must not turn our attention from what we are writing to how we are writing because if we pause, our thoughts escape. While we puzzle over word choices and spellings, the rich feelings, perceptions, and ideas within us slip away. We must write quickly in order to include everything we have to tell. Thanks Diana! Your enthusiasm is infectious…now even i am eagerly waiting to see how this writing challenge will prosper! Thank you Suzanne, both for reading the post and commenting. I think that being honest with one’s self is key to healing and growth. I didn’t realize though that I am being transparent in my writing. That’s a great compliment!